The optimum tourist carrying capacity of Macau stood between 32.6 million and 33.7 million visitors in 2014, or 89,374 and 92,325 tourists a day, says a new study by the city’s Institute for Tourism Studies (IFT). Although the optimum annualised capacity level was above the record 31.5 million visitors the city welcomed last year, “Macau’s capacity to absorb visitors may have reached a saturation point” in 2014, noted the researchers, headed by Leonardo Dioko, director of the IFT Tourism Research Centre. That is because the daily optimum tourist carrying level was largely surpassed several times last year, impacting the perceived quality of life of residents and the travel experience of visitors. 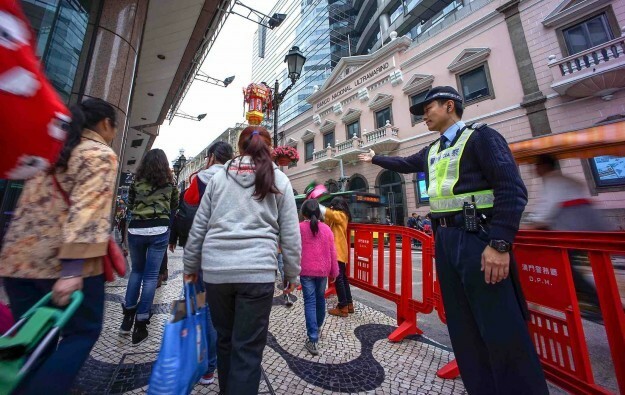 The Macau government in February announced it would discuss with Beijing a possible adjustment and improvement of the Individual Visit Scheme (IVS), covering travellers from the mainland. On Monday, the city’s Chief Executive, Fernando Chui Sai On, said the aim was to find a balance between tourism capacity and local residents’ quality of life. Mainland independent travellers accounted for 30 percent of the overall visitor arrivals to Macau in 2014. The IVS was first implemented in 2003 and currently covers 49 mainland cities. The system allows mainland passport holders to visit Macau and Hong Kong as independent travellers rather than as part of a tour group. Japanese brokerage Nomura earlier this week warned that tougher visa rules risked further harming Macau’s casino industry, already experiencing its worse post-gaming liberalisation crisis. Casino gross gaming revenue in Macau has dropped for nine consecutive months as measured in year-on-year terms. The IFT study, presented on Thursday, pointed out that the capacity of several tourism services and facilities in Macau, including the number of hotel rooms, were currently unable to cope with demand and could be “inadequate particularly during peak periods”. Public transportation was a problem. “The physical capacities of transportation, especially taxis and public buses, remain strenuous,” the research noted. The IFT optimum tourist carrying capacity estimates were based on a survey conducted in 2014. The interviews measured residents’ satisfaction with the number of people visiting Macau and also tourists’ satisfaction with the quality of their visiting experience. About 6,000 people were surveyed, almost evenly split between Macau residents and visitors. The study, part of an annual series commissioned by the Macau government since 2003, featured several recommendations. It noted the importance to grow the handling capacity of key infrastructure and facilities. “Additional room capacity provided by recent (and upcoming) new hotel properties, for example, will not prove efficient if there is no corresponding increase or enhancement in other areas such as public transport and improvements in service quality,” it stated. The number of hotel rooms in Macau is set to almost double over the next few years. There were 25 hotel projects under construction and 28 projects undergoing government approval at the end of last year, which would together provide close to 25,900 new hotel rooms to Macau, according to official data published earlier this month. But recent reports indicate that two of Macau’s major transport infrastructure projects are facing further delays, including the Light Rail Transit system designed to move visitors and locals swiftly around the city. The recommendations did not include the introduction of any cap on the total number of tourists coming to Macau. Instead, researchers argued for a more even distribution of demand throughout the year and throughout each day, making better use of marketing and other promotional tools. The study also mentioned the need for greater diversity and quality in tourist source markets.